Why have a plain cheeseburger when you can go for the gold? 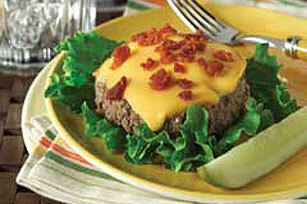 We used VELVEETA and a sprinkling of bacon pieces to make these winners. Shape meat into 4 patties. Cook in dressing in large skillet on medium-high heat 10 to 12 min. or until done (160ºF), turning after 5 min. Top with VELVEETA and bacon; cover skillet with lid. Cook 1 to 2 min. or until VELVEETA begins to melt. For added freshness, serve each burger with crisp leaf lettuce. Serve in whole wheat hamburger buns. Serve with bagged lettuce greens tossed with cut-up fresh vegetables. Top with your favorite KRAFT Light Dressing, such as Ranch.